﻿ How to Stand Out (and Win Prizes) With Holiday Images » Red Mango Marketing! What’s the best way to make sure your marketing stands out this holiday season? Holiday images are a great way to grab attention in busy email inboxes and social feeds. And content with images gets 94 percent more views than content without. Try using images of your products, services, environment, and people in your emails and social media posts this holiday season. In addition to getting your customers to stop and look at your promotions — visuals can help you win prizes! Today we’re launching the #CTCTHoliday Decked Out Sweepstakes. Throughout the entire month of November, your business can benefit from photos you share as you prepare for the holiday season. Take a photo of your business prepping or getting prepped for the holidays. Upload it to Facebook, Twitter, or Instagram using the hashtag #CTCTHoliday (and make sure the post is public so we can find it). You’ll be entered to win one of 10 prizes. We’re giving away a grand prize of a custom Constant Contact campaign design and a $500 Amex gift card. Three winners will receive a custom Constant Contact campaign design. Six winners will receive $250 Amex gift cards. You can find the contest details, rules, and regulations on our #CTCTHoliday Decked Out Sweepstakes page. Not sure what kinds of photos you should share? Give a behind-the-scenes look of your business. Share images of the products you’re offering this year. Take a photo that tells the story of how you and your staff get prepared. Show off your expertise. Or take a selfie with your staff or customers to show off the people that make your business special. If you want to see these ideas in action, follow along on Constant Contact’s Instagram account. We’ll be sharing photos with these themes each day throughout the month of November. Looking for resources to help with the rest of your holiday email and social media marketing? Our Holiday Headquarters has everything you need for your best ever holiday season. 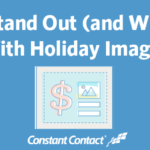 The post How to Stand Out (and Win Prizes) With Holiday Images appeared first on Constant Contact Blogs. This entry was posted on Monday, October 31st, 2016 at 10:15 am	and is filed under Email Marketing, images, News & Updates, Online Marketing, Social Media Marketing. You can follow any responses to this entry through the RSS 2.0 feed. Both comments and pings are currently closed.